Now you can diversify in precious metals minus the fees associated with buying coins and bars directly. 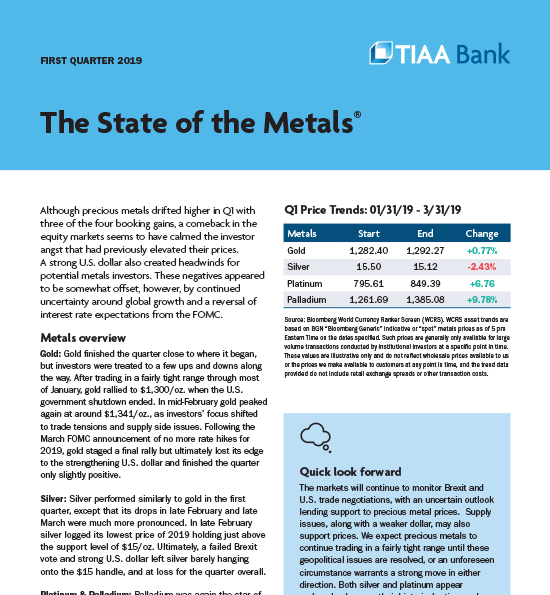 With our non-FDIC insured unallocated metals solution, you simply buy into a pool of metals that’s securely stored on the behalf of you and other TIAA Bank clients. You’ll pay no storage or delivery fees, yet still reap all the same potential financial rewards had you opted to buy specific coins or bars. Go all in. Or go in over time. With unallocated metals from TIAA Bank, we empower you to diversify in metals on your terms. This is a smart solution for those who prefer to time their metals purchases based on market conditions and expectations. Our automatic purchase plan is used by investors who aren’t interested in trying to time the highs and lows of metals investing by utilizing dollar cost averaging as part of their investment strategy. Where are metals prices heading today? What trends are our experts keeping a close eye on? Find out this and more by signing up for our free quarterly report, The State of the Metals®. Do you appreciate the intrinsic worth of precious metals? Are you looking for a possible hedge against inflation and periods of world economic instability? Access many of today’s most popular coins and bars for less than 1% over the price available to us. Looking for a specific coin or bar that’s not currently shown on our site? Our metals experts would be happy to procure it for you. Complete the form, and we’ll be in touch. A metals expert will be in touch soon. The displayed precious metals prices and pricing trends are delayed and are based on indicative or “spot” prices and do not reflect any actual market transactions. The pricing trends show intra-day pricing performance. These prices and trends are illustrative only. They do not reflect Wholesale Prices available to us, the Customer Prices that we make available to customers at any point in time, or any spreads or other transaction costs. Past performance is not a guarantee of future results. We do not guarantee the accuracy of this data. See our Account Terms, Disclosures, and Agreement Booklet for more information on how we calculate our Customer Prices.